One of the things that made us excited about doing this Eldritch Horror review was that it was getting praise for being a cleaner version of Arkham Horror. Below you will find a general overview of how to play Eldritch Horror and our collective thoughts about the game. 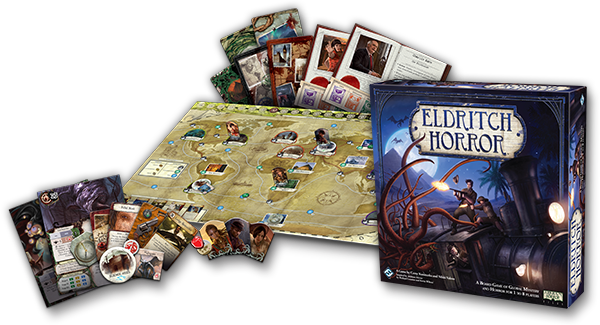 Eldritch Horror is an adventure game in which you and your teammates must travel the world and hold back the approaching monsters, brutal encounters and terrifying mysteries. You must all work together solve those mysteries and prevent the awakening of the Ancient Ones. If you’ve read our Arkham Horror review, then you will have a pretty good idea of how to play this game. 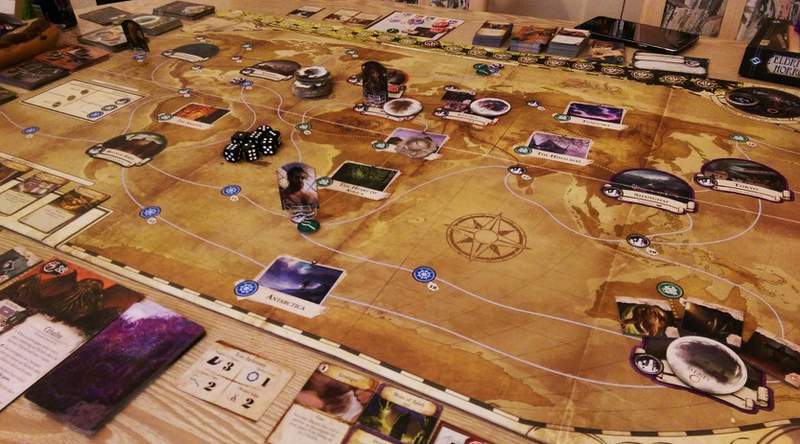 The one big difference between Arkham Horror and Eldritch Horror is that you are traveling all over the world in this one rather than just in Arkham City. Below is an overview of how each game of Eldritch Horror plays out. At the start of the game, a randomly selected player is chosen as the Lead Investigator. All players then receive any items specific to their characters listed on the back of their character cards. There are three phases to each round of Eldritch Horror: the Action phase, the Encounter phase, and the Mythos phase. In the Action Phase, players can travel, rest, trade, prepare for travel, acquire assets, or take component actions. The component actions available to each character are listed on the backs of their cards. Next comes the Encounter Phase. Each investigator will draw an Encounter card and may meet a new character around the world, or fight a monster. Finally there’s the Mythos phase, in which a Mythos card is drawn and lists the events that will occur. This includes the spawning of new gates to the Other World, the appearance of new monsters, producing new clues, and spawning new rumors. These clues, rumors and encounters are used to solve the mysteries that come up and develop all over the board. All of the investigators are eliminated. The Mythos deck is emptied. The Ancient One awakens and defeats the investigators. Eldritch Horror is a cooperative adventure / horror game. While it’s not one of our favorite co-op games, it does do an excellent job of bringing H.P. Lovecraft’s works to life on a board. Every time a monster comes out, you will find yourself saying “Oh no!” no matter how “easy” or tough it may be. The theme works extremely well and is the highlight of this game. As is the case with its predecessor, Arkham Horror, there is very strong storytelling in Eldritch Horror. Arguably, it is better, as it allows for more story development and more interaction from the characters. Where Arkham Horror was confined to a single town, Eldritch Horror spreads itself out across the entire globe, giving a greater sense of movement and story. Corey Konieczka, Nikki Valens and Fantasy Flight Games also deserve credit for creating an easy-to-learn board game. Unlike Arkham Horror, each step of every round is clearly laid out in the rulebook, so new players will be up and running in no time. Eldritch Horror is low on character development. While it does allow for some interaction and player influence on the story, players do not have much control over how much and in what ways their characters grow throughout the game. The game is pretty long, especially at the higher player counts. Games can last over three hours for 6-8 players. Eldritch Horror is considered one of the best cooperative horror games because it is heavily thematic and tough to beat. Most Lovecraft and/or horror fans will love this one, but gamers who want a bit more character depth may want to look elsewhere. Most of the people in my gaming group think that Eldritch Horror is an improvement over Arkham Horror. We do bring it to the table every once in a while, but most of us prefer Elder Sign (especially with the expansions) since it is quite a bit shorter and has the same theme. As is the case with most Fantasy Flight games, you can get a bunch of Eldritch Horror expansions if you end up enjoying the base game. Thanks for taking the time to read our Eldritch Horror review!